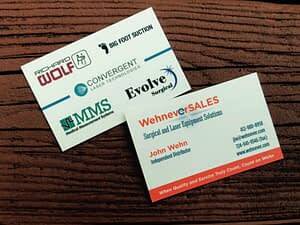 business cards for Wehenver S.A.L.E.S. It was important that the logo make reference to the client’s last name, Wehn, so we used a little clock in the word Wehnever. The client is in medical equipment sales and much of his business is with medical lasers, so we also tried to incorporate a “laserbeam” into the logo.